Being a social media addict, it is not easy to NOT like Facebook or sorts. There have been really strong reasons, however, behind writing this article. We all 'Facebook' for one or the other reason. But there may be many others, why we should not. People that could be on Facebook weren’t really there. How to produce original content? As an amateur blogger, like millions of others, I must find the answer to this burning question. In my recent conversation with someone very close and frank with me, I got an honest feedback that my last few articles weren’t so charismatic as he had expected them to be. I couldn't blame him. I was so indulged in the urge of writing something – absolutely anything to start with, that I partially (or fully?) failed to justify the topic. But what else could I have possibly done? I have picked information from forwarded emails, anonymous quotes, newspapers and books to write inspired articles in the past. Many of them were gladly received, liked and commented on. But did I really deserve that? At least I wasn’t satisfied. And when I managed to break out of the shell, it had a direct and much tougher competition with my own writing of the past. While I’m about to watch it (n+1) th time today, the only question running through my mind is – why would anyone not like Delhi 6? That’s a question for those to answer who can’t appreciate this phenomenal creation. I belong to the proud-others, who’re sane enough to understand and digest its perfection. Arthi is back to pen her thoughts down and so is Train to Pakistan - one of my long-loved books. Here's a guest post, the book review of Train to Pakistan. 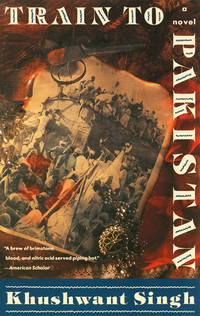 Train to Pakistan is a book based on the partition of India Pakistan right after India's independence. It takes us to the summer of 1947 to Mano Majra, a tiny village in Punjab. The partition means almost nothing to the local villagers and all is well between the Sikh farmers and Muslim tenants of the village until the local money lender Ram Lal is murdered. Jugga and the England-returned social activist become the prey of Punjab police. The heavy drama shifts drastically when an eastbound train makes an unplanned stop at Mano Majra, coaches full of corpses. The flabbergasted villagers have not yet accepted the truth when reality slaps them once again when Sutlej floods from neighbouring village. Action paces on as the magistrate, Jugga, Iqbal (the social activist) and village heads try to tackle the revolting violence. Also, the attitude of local police and niggling government officials is very nicely portrayed. The end, however, leaves a lot of open threads. Once I was about 4 - 5 pages away from the end, I was keen to know how will he end the series of misfortunes in the village. Frankly, I was a bit disappointed since I was expecting something out of Mr Iqbal as well. But to sum it up, Mr Singh's eye to detail makes it a total page-turner. Train to Pakistan gets a "Must Read" tag.